Sagamore Hill Stables offers high quality care for the competition horse. Horses are fed Triple Crown feeds twice daily and high quality timothy/alfalfa hay three times daily. Stalls are cleaned two times per day and 4 bags of shavings are added weekly. All buckets are cleaned daily and horses receive a minimum of 3 hours of turnout per day. Horses receive medication and supplements in the morning as needed. Horse’s blankets are changed and boots are put on as needed for turnout. All horse’s hooves are picked out when they come in from turnout. Personalized attention to the needs of every horse ensures that they are happy and content, ready to perform at their best for their riders. Full Service and Training Board packages are available. 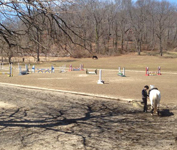 Sagamore Hill Stables offers private riding lessons Tuesday–Sunday by appointment only. We offer lessons to children as young as 5 and teach beginners through advanced riders. We have a wonderful group of high quality lesson horses that allow our riders to develop the appropriate mental and physical skills needed to advance in the sport. One of our specialties at Sagamore Hill is working with young horses and problematic horses. By giving a horse time to properly learn the basics we have trained many wonderful Hunters and Jumpers that can be seen winning in the ring today. References available upon request. For the rider who is unable to purchase a horse or for those thinking of purchasing and looking for an introduction we offer half leases on some of our school horses. 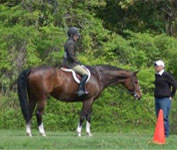 A half lease entitles you to three days of riding per week one of which must be a lesson day. For more information please contact us. We participate in many local and A rated horse shows throughout the year. Many of our students earn series and end of year awards as well as qualifying for Zone and National Finals. For a copy of this years horse show calendar please click here.